The Fox Theatre in downtown Tucson opened in 1930. Forty-four years later, the historic joint was face-to-face with a wrecking ball, part of the decline of another American downtown. For yet another 26 years, the theatre stood empty, awaiting something, anything, that might make it relevant again. At the start of a new century, the Fox got a swift kick from Tucson's revitalization community, and was restored to its early splendor, replete with a gorgeous new marquee sign. Events have been sparse since the grand re-opening a year or so ago, with a mix of live performances, film and music making up the sporadic schedule. November 26th saw the arrival of two acts perfectly suited for the Fox's austere and classy environs. 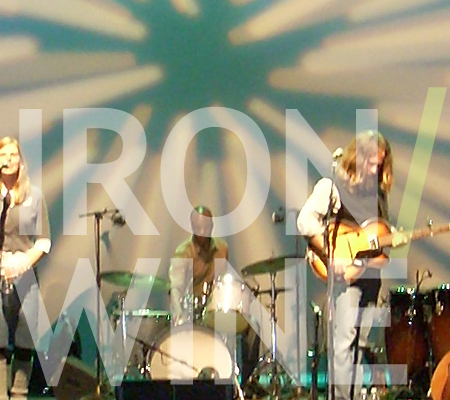 Iron & Wine came back to the Old Pueblo, this time around sans hometown favorites Calexico, with whom Sam Beam recorded the well-received In the Reins collaborative EP [LAS review]. Opening for Beam last week was the phonetically similar Califone, made up of former members of Chicago's disbanded Red Red Meat, including the city's production guru Brian Deck, who has recorded and performed on material from Iron & Wine as well as Modest Mouse and a slew of others. Perhaps it's no coincidence that Califone shares the township of Wilco, as the two bands both traffic in experimental folk Americana, with tremendous results. The superb openers provided the slowly filling venue an ambiance more than a focal point, their soundtrack incorporating banjo, fiddle, guitar, drums, and more percussion than a Mickey Hart drum circle; and thanks to the theatre's phenomenal sound system, every little shake, rattle and roll was clearly audible, akin to a classical music hall. In concert with their traditional instrumentation, Califone also employed much in the way of noise and effects, which was an interesting juxtaposition within the context of their otherwise spare and melodic songs. Overall, the group was thrilling to watch; the harmonies and rhythms that initially floated unassumingly about the crowd had slowly culminated into a weighty presence that sucked in the growing crowd. The band's set was well executed and well-received, although I'm still not sure what Tim Rutili's gripe was about Tucson's "cops" and "street cameras" - aren't all cities Orwellian these days? Iron & Wine meandered on to the stage in serene fashion. Beam is a man of few words, and even less inclined to showy performances. Like a similarly bearded iteration of Jerry Garcia, he simply lets his songs, and his incredibly smooth fretwork, do the talking. And when you have a catalog stacked with a few dozen beauties, why not? Ably backed by an ensemble of a half-dozen players, plus his sister Sarah on backing vocals and fiddle, Beam gave the near capacity crowd what they came for, breezing though the meat of his three previous albums, with a heavy tilt toward The Shepard's Dog, which Sub Pop released earlier this year to a chorus of Best of 2007 predictions. Owing to its stately rejuvination at the hands of the Fox Tucson Theatre Foundation, patrons are required to take in the performances at the reserved Fox from a seated position, which inevitably leads to a point when persons like myself begin to feel a bit antsy. By the time I had tired of sitting Iron & Wine's songs had begun to sound a bit two-dimensional, and the jolt of Beam's angelic warbling and whispering was wearing off. As if scripted, Beam promptly cued up the remarkable "Resurrection Fern," a song that immediately brought myself and everyone else back to life. The song's potency was due in part to the differences in the version played live, with the refreshing chorus and harmonies especially strong. Here I may as well digress to reference the Grateful Dead once more: one thing that made that band special in a live setting (beside the kool-aid) was their dynamic way of shifting songs from the studio versions. In order to exact a similar reputation, Sam Beam needn't make Iron & Wine into some Phish-like circus (heaven phorbid), but may do well to take a cue from the pervasive Haight Street vibe of living and playing in the moment, and making each moment different. Damn the jam, but throwing some off-camber live sparks can light some fires. A staff writer for LAS, Ari Shapiro mixes up pretty unique smoothies at XOOM in hot Tucson. See other articles by Ari Shapiro.